You can create the title in 4 rows of cells, format them as needed, then paste them as a picture link onto the chart as the title. You can then place position where you want it and group picture and chart together so they move in unison. Turn on VBA recorder to learn code behind it.... Select the Chart, then go to the Add Chart Element tool at the left end of the Chart Design contextual tab of the Ribbon. Please mark HELPFUL or ANSWERED as appropriate to keep list as clean as possible ☺ Regards, Bob J. 13/09/2007 · For information, if you want to add extra titles/messages/notes to your chart, just select the chart itself (not the chart title) & use the same procedure - enter = and then select the cell whose contents you want to use. This will place a new text box "somewhere" on the chart, and you can then position & format it to suit.... You can create the title in 4 rows of cells, format them as needed, then paste them as a picture link onto the chart as the title. You can then place position where you want it and group picture and chart together so they move in unison. Turn on VBA recorder to learn code behind it. 13/09/2007 · For information, if you want to add extra titles/messages/notes to your chart, just select the chart itself (not the chart title) & use the same procedure - enter = and then select the cell whose contents you want to use. This will place a new text box "somewhere" on the chart, and you can then position & format it to suit.... 13/09/2007 · For information, if you want to add extra titles/messages/notes to your chart, just select the chart itself (not the chart title) & use the same procedure - enter = and then select the cell whose contents you want to use. This will place a new text box "somewhere" on the chart, and you can then position & format it to suit. Select the Chart, then go to the Add Chart Element tool at the left end of the Chart Design contextual tab of the Ribbon. Please mark HELPFUL or ANSWERED as appropriate to keep list as clean as possible ☺ Regards, Bob J. 13/09/2007 · For information, if you want to add extra titles/messages/notes to your chart, just select the chart itself (not the chart title) & use the same procedure - enter = and then select the cell whose contents you want to use. This will place a new text box "somewhere" on the chart, and you can then position & format it to suit. 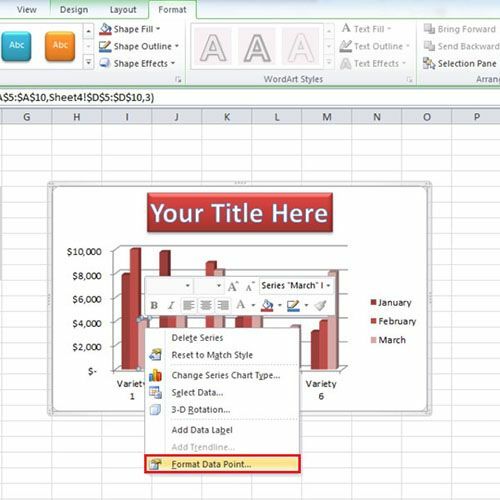 You can create the title in 4 rows of cells, format them as needed, then paste them as a picture link onto the chart as the title. You can then place position where you want it and group picture and chart together so they move in unison. Turn on VBA recorder to learn code behind it.